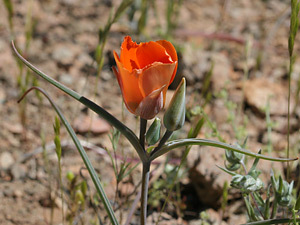 Habitat: Desert, Upland. 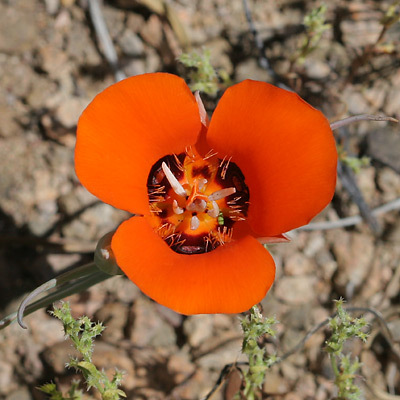 Orange-flowered Desert Mariposa Lilies are most common in dry, rocky desert areas, while the yellow-flowered ones are typically found in grassy upland areas. Flowering Season: Spring. 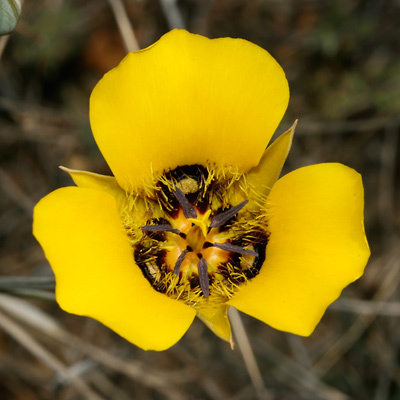 This beautiful wildflower blooms in March or April in years with sufficient winter rain. Description: The flowers are up to 3 inches (7.6 cm) across and have three fan-shaped petals, each with with black or purple at the base. The leaves are grayish green, narrowly linear and grass-like with margins curled upward. The stems are slender and upright.